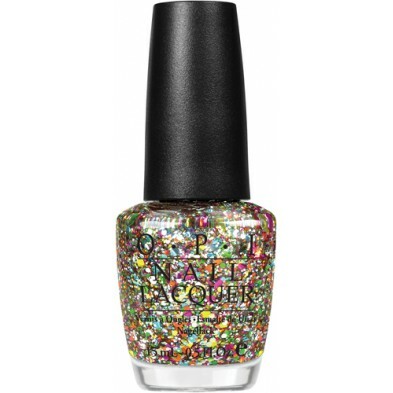 I rarely rush out to purchase new nail polish when collections hit, but I love The Muppets like no other, so the OPI Muppets-themed polishes were on my list of shades to check out. I, being a firm believer in all things shiny, immediately fell in love with Rainbow Connection, a multi-colored chunky glitter polish with a clear base. This is more of a toe color for me, but I decided to try it out on my fingertips for our New Year's Eve party this year and it was a big hit. 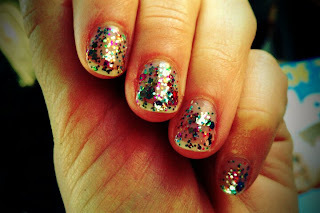 My only complaint is that it takes several people and a bucket of acetone to remove it; however, I have learned that you can cut the time in half by using a washcloth to remove glitter polish. There is something about the slightly rough surface of a washcloth that helps speed the process considerably. Also, make sure to apply two layers of a good topcoat to protect the pieces of glitter, otherwise you will be catching them on things like lace shirts, pantyhose and hair all evening (very annoying).